We have created numerous luxurious home cinema interiors to suit various project locations. From cinemas in contemporary chalets to prestigious London residences, each project is designed to reflect the individual client’s brief, taste and personal requirements. This family home cinema uses both simple lines and geometric pattern to achieve a stylishly contemporary relaxation space; The patterned wall and ceiling panels have important acoustic properties as well as adding to a sense of theatrical fun and playfulness, heightened by the quirky, plaster-in wall lights that seemingly hover just above the brightly coloured side tables! Dark fabric tones for upholstery complement the overall palette, permitting the accent shapes and colours to stand out in sharp and exciting contrast! But in this room, there is no pretence or preciousness – it is most definitely a space that is ‘family-friendly’, in terms of finishes, comfort and practicality. 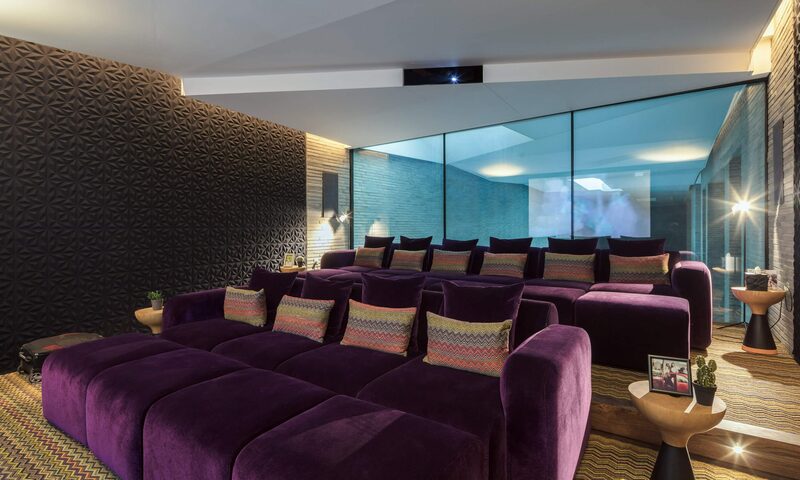 This London home cinema is suspended within the upper level of a Grand new build basement giving connecting views down over the pool below with spa finishes entering through the cinema glass before changing to softer tones specified to help with the quality of sound. The feature 3D wall covering emulates the triangular motion of the basement ceiling which dances towards and into the cinema room before stopping to neatly conceal the projector. 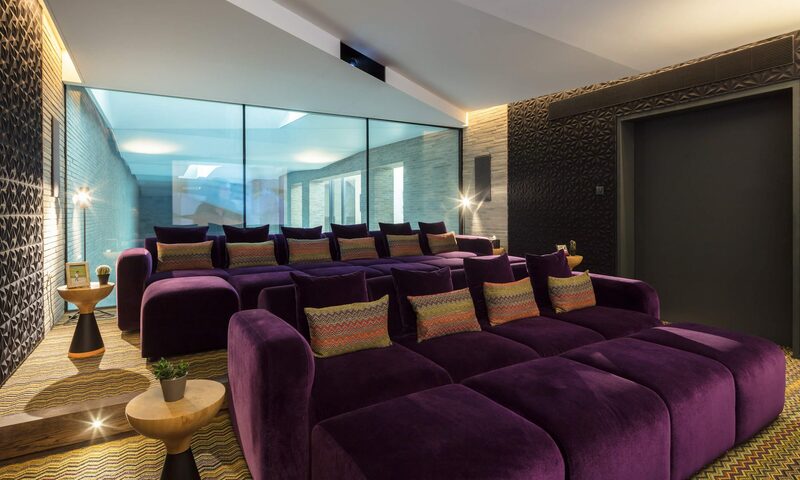 The cinema experience begins by entering over a glass bridge and through a purple polished plaster tunnel acting as a transition point between facilities and finishes, rich colour tones then add fun within the cinema interior creating an inviting space to crash out on the deep velvet upholstered furniture, contrasting the textural greyscale basement pool hall volume below.